Spring is here and so are the Mahimahi! April has been a good month for Mahimahi as well as Spearfish and Striped Marlin. Nice Mahi's in the 15 - 30lb range. Some nice Blue Marlin were also caught or released. The Ono (wahoo) have also been around lately, with more to come probably in May as May is usually a good time for Ono along the 4 fathom curve. As for bass fishing on Kauai, mid April was tough with the floods on Kauai, but the water has cleared up in the rivers and Tom has been out catching again. The bass have been larger in size rather than quantity, but Tom has landed some huge ones. He had a nice 8lb plus largemouth bass right after the storm and he has been catching nice smallmouth's in the 3-5lb range as well as largemouths. Near the end of the month as the water really cleared up he saw some huge smallmouth's in the 6lb range fighting a huge largemouth in the river. He couldn't get them to bite that day but was going back to the spot to try again as he knows they are there. Peacock bass have not started biting yet, hopefully in May as the weather warms up. 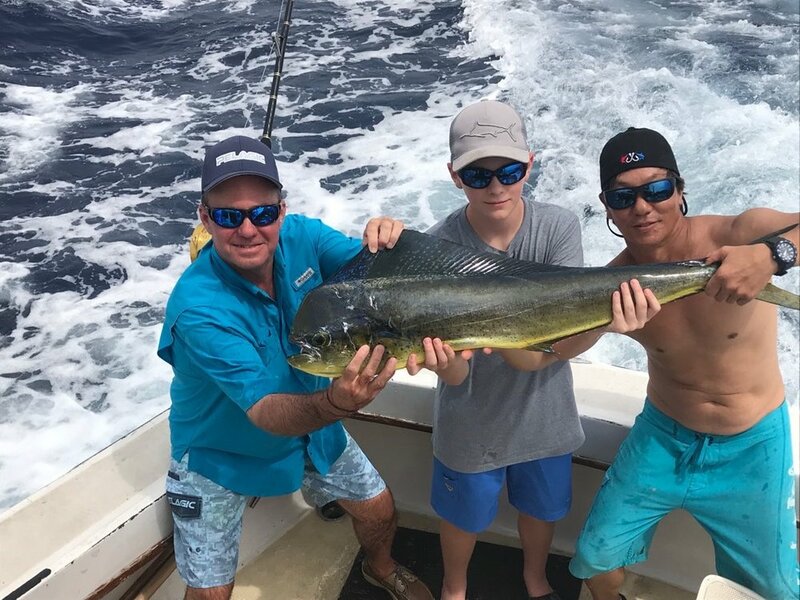 Nice Mahi Mahi caught off Oahu in April!